Little Miss Sunshine leads to The Last King of Scotland? 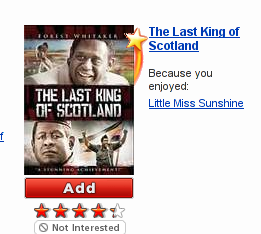 As shown at right, Netflix is suggesting I should get _The Last King Of Scotland_ because I liked _Little Miss Sunshine_. One suspects their algorithm contest has not borne the sweetest fruit. You know, IE7 looks like a reasonable browser, but it’s not. To prove this it’s not even necessary to resort to something like CSS compliance, where no one else gets it entirely right either. It doesn’t even get HTTP right. That is, when confronted with a perfectly legitimate 204 status code if fucks up. Spectacularly. p. Needless to say, if you’re doing ajax-style processing, and, say, letting people delete stuff out of a list, then having a code that let’s you say, “Yeah, we succeeded, there’s nothing more for us to say, nor any need for you to redisplay or anything, though.” is pretty damned useful. Would you like to know what IE does to the 204 response code? It *changes it to 1223*. For those not inculcated in the minutia of HTTP, all response codes are three digits, with the first digit indicating the general category of response (1 is informational, 2 is success, 3 is redirection, 4 is for client errors, 5 is for server errors), and the additional digits giving more specific information. 1223 isn’t even on the map here. This has been a problem for at least five months, since that’s when “a bug was filed in the dojo toolkit’s trac about it”:http://trac.dojotoolkit.org/ticket/2418. How can Microsoft be taken seriously? All that money, all those programmers, and they can’t do better than this? Where was this when I was trying to get through poetry classes? bq. Rhyme & Reason is a suite of online tools for poets and lyricists. It includes an editor for writing verse, an integrated dictionary, rhyming dictionary and thesaurus for finding words, metrical scanning tools for identifying meter and rhyme scheme, as well as features that allow you to share your work with others and comment on other writers’ poems or lyrics. Now I don’t really give a damn about rhyming dictionaries and thesauruses–I already know too many words, who needs more–but I was always having to look up the metrical stuff (what’s the stress pattern in a “spondee”:http://en.wikipedia.org/wiki/Spondee again? ), and having this done automatically would have been _excellent_. At a few minutes past 11am today, we put Tucker to rest. He had just turned 19 on May 1st. He was unimaginably old, but up until the last week or so, he seemed comfortable and happy. He was still climbing on top of the television to get in his basket, and climbing up the stairs to visit me in my office when he got lonely. 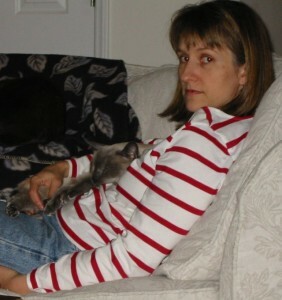 Tucker had been with Anne since before I was, and he was always undoubtedly _her_ cat. Over a period of years, though, he came to regard me as an adequate substitute if she wasn’t around. Especially as his health had gradually declined the last couple of years, I spent more and more time taking care of him during the day–feeding him when he was hungry, trying to make up for the attention he no longer got from “Ford”:/2006/02/all-things-must-pass.html, etc. To say it’s wrenching to not have him around doesn’t do it justice. I know that, in time, the acuteness of the loss will fade. But right now it’s fresh and raw.